DLM Enterprises in Florence provides residential HVAC services from product selection to repairs. You’ll receive personalized service for cost effective prices. Rest assured you won’t speak to a different technician every time you call. Our experienced staff can service any heating or cooling fixture, including maintenance and repairs. We work with window and central air conditioning units, gas and electric furnaces, ventilation systems, and water heaters. DLM Enterprises will winterize your units or prepare them for summer, as well as making any minor or major repair to keep you warm in the winter and cool in the summer. We have a large stock of furnaces, air conditioners, water heaters, thermostats, and HVAC accessories from top of the line manufacturers such as TEMPSTAR and Trane. Our product options include units to heat and cool any size home, from a one bedroom apartment to a four bedroom, two-story home. Whether you need gas or electric, basic models or deluxe units with every feature available, our staff will help you find the best products for your home. If you are building a new home or need to replace your furnace, DLM Enterprises provides complete heating installation, including new or redesigned ventilation systems. We have units with replaceable filters and filters you can clean and reuse, along with several options for gas and electric systems to suit the size of your home and your budget. We’ll help you keep your home warm and your energy bills low. 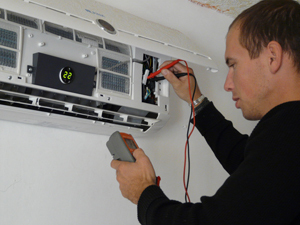 Our technicians also install air conditioning units, including central air and window units. Whether you need a new unit to complete home construction or you need to replace an outdated or worn unit, DLM Enterprises removes the old unit and completely installs a new, energy efficient air conditioner. Stop sweating during the summer and improve your indoor air quality with one of our affordable air conditioning systems.